So I'm in Florence right now. Started in 1882, with a planned completion date sometime in the next twenty years, the Temple of the Sacred Family, or La Sagrada Familia is the ultimate example of budget and time overruns. I mean, really. I know that it is very huge and very elaborate what with the stained glass and the marble arches and the stonework covering the outside, but over one hundred years and still under construction??? We were able to go and see the work on this cathedral and go up one of those impressive looking towers (four of the towers are completed, there will eventually be thirteen - one for each apostle and a big one in the middle for Christ. I have walked through a lot of old Catholic churches in my time, but this was the first time I´ve been able to see one in the process of being built. Priests and nuns were replaced by men in hard hats and ticket takers. I´ll be interested to see La Sagrada Familia when it is completed. It is going to be an awesome and beautiful building. But I wonder if it will succeed in pointing people toward Christ or toward man´s architectual prowess. PS: These aren´t my photos. Will share some when I get home. I would love to write more, but I´m on a ticking internet cafe clock! Tyler and Laura stopped by on their way home from South Africa for about five days. We flew to Ireland and boy are our arms tired! From Dublin we took a bus tour into the country. The ceiling on the bus was super low. This is Tyler saying, "Jess, I'm not a freak show!" Cool Celtic cross at an old monastery. And here I thought an Irish weaver was some kind of bird. No trip to Dublin is complete without a trip to the Guinness Storehouse. Everything you ever wanted to know about Guinness. And a lot more. Then it was back to Bath for a short night of sleep before heading to London the next morning. They look pretty chipper for 4:20 am. ...and then a musical! We Will Rock You is, hands down, the best musical featuring the songs of the legendary band Queen that I've ever seen. It was a very cheesy and very fun show. Bohemian Rhapsody will never be lame. 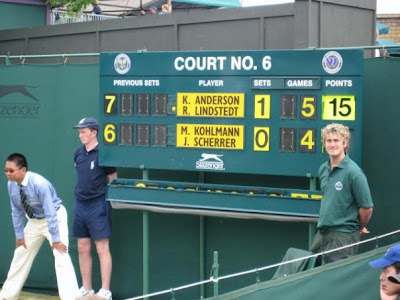 So Wimbledon is this tennis competition that happens every year in London. All the best players are there and the courts are grass. Yeah, that's right. See how much I know? I'm pretty much a tennis expert, now. But it wasn't long ago when the bulk of my knowledge about the sport came from playing Super Nintendo Tennis. When John McEnroe could have been a celebrity chef or a mandolin player. When a Grand Slam was nothing more than an egg-heavy breakfast dish served at Denny’s. But now I've been to Wimbledon, so I know lots of stuff. First of all, I know that it takes a loooong time to get into Wimbledon. In order to buy day-of tickets to the tournament, you must wait, for several hours, in what is affectionately and accurately called “The Queue.” Thousands of people stand, sit, or stretch out in The Queue as it winds its serpentine way around a huge field. As we took our place in line, we were handed a queue card, designating our position and eliminating the ever-present temptation to cut, and (I kid you not) a pamphlet on "queuing etiquette." Aren't the British just so cute? Newspaper vendors walked up and down between the folds of the line hawking their wares. There were plenty of coffee stands and toilets. Next to us, in a patch of open grass, a football (soccer) game started up. It was nice. You can't fight the queue, man. You gotta embrace it. 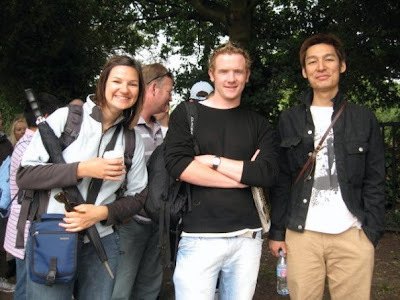 Here we are in the queue: Me, Jonny and Tomoki. 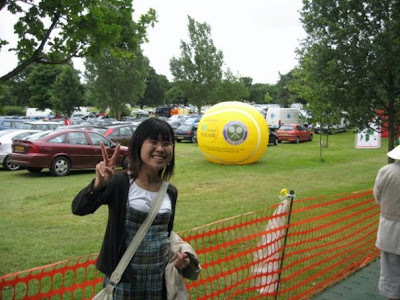 And here's Mina...and a giant tennis ball. Awesome. These pictures are actually all Mina's because I was a dork and forgot to put my memory chip in my camera. Fast forward three hours, and we're through the gates, ready to watch some tennis. Secondly: The real show is on the sidelines. I don’t mean the fans. In fact, I think that tennis ranks second only to golf for most boring fans ever. What I mean is that it truly takes a village to run a tennis match. In the match we watched, there were five line judges, six ball boys/ball girls (ball people?) and a small army of teens in green polo shirts on rain patrol. The ball boys and girls were fun to watch because I don’t think I’ve ever seen anyone scurry that much in real life. They ran everywhere they went – even very short distances. And when they weren’t running or crouching at the net, they were standing “at-ease” at each end of the court, with tennis balls in their hands to give to the players. It was a little silly looking, but I gotta admit, a very smooth system. I learned some other stuff about tennis, but I think that I’ve covered the bulk of the important info. 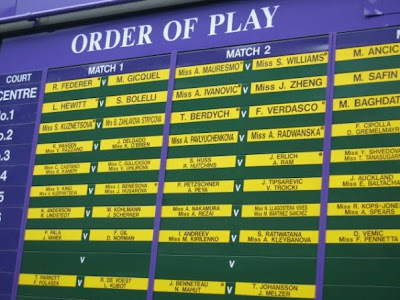 Wimbledon’s over now – the men’s finals were on Sunday in one of the best championship matches ever. Federer, the reigning champ who has won Wimbledon for the past five years, was trying to be the first person to ever win six championships. But he was beat out in a match that lasted nearly five hours by a Spanish guy named Nadal. I watched the highlights because I’m such a tennis fan. On the women’s side, I think that Venus Williams won again in a championship match against her sister, Serena. Feel free to forward me any of your tennis-related questions.